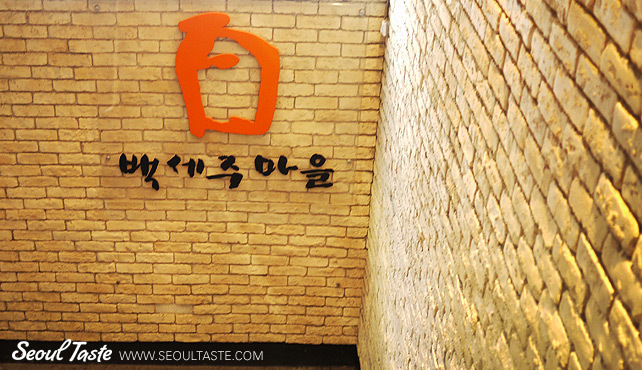 The restaurant is located just off of Gangnamdaero, less than a minute from Gangnam Station exit #5 (it'll be on your left). This definitely being some sort of 술집 (bar), we started off with a drink. 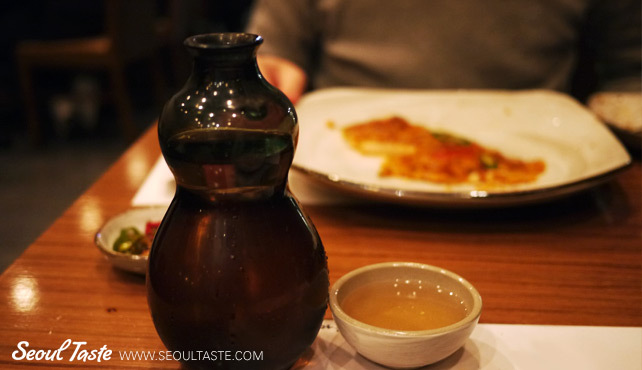 맑은 백세막걸리 (baeksae-makgeolli) sounded interesting, so we ordered a small bottle to try. 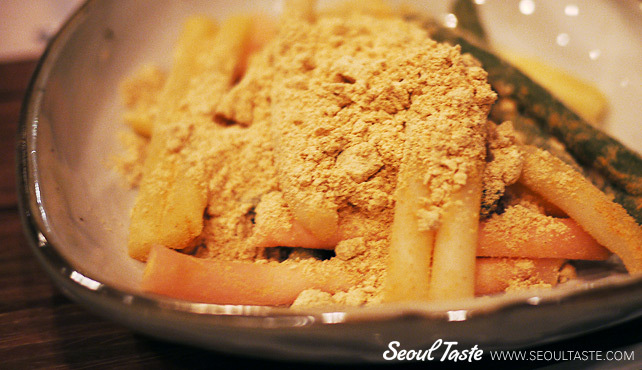 백세막걸리 looks and tastes very much like half Bek Se Ju and half 막걸리 (Korean rice wine), which it very well could be. After we ordered our food, we received a curious 반찬/안주 (side dish): cold 떡 (Korean rice cake) covered with a kind of bean powder. Sounds odd, but we enjoyed this simple appetizer. 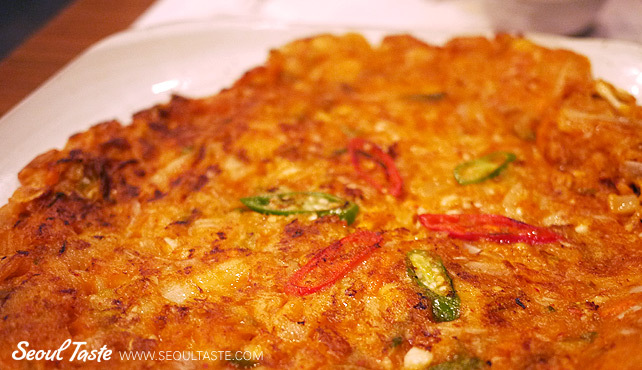 The first thing we ordered was a 해물김치전 (seafood and kimchi fritter). Happily, they served up a perfect example, with finely chopped squid and kimchi. Best of all, it was made not with the usual plain flour batter, but instead had the telltale consistency of grated potato, our favorite kind of jeon. 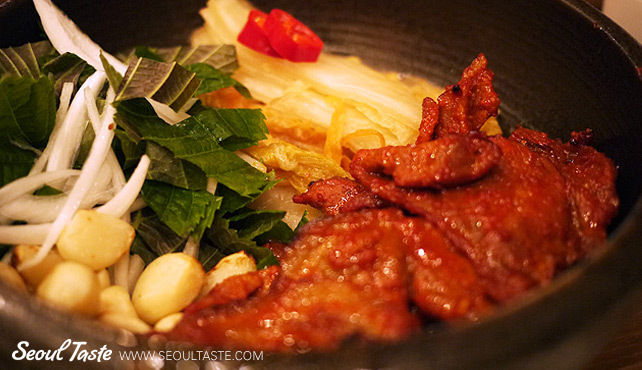 Next up was the 흑돼지 고추장구이 (barbecued black pork in chili pepper paste). This was served in a bowl with grilled garlic, sliced onions and 깻잎 (sesame leaves), along with white kimchi for wrapping. 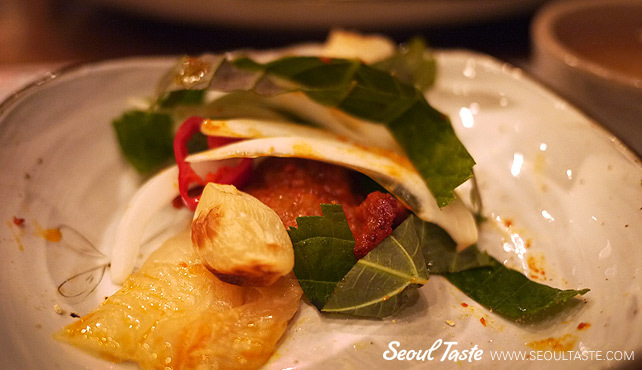 Although on a little pricey side at 21000원, we really enjoyed this dish, as all the flavors complemented each other well. The contrast of the hot pork against the cold white kimchi wrap only made it better. Since Bek Se Ju is in the name of the place, and this is the only place you can get the "draft" version, how could we not order some? Well, it was all right, but honestly, it wasn't better than the bottled version you can find in stores. However, it did go well with our meal (as expected). Food: 5/5 – Excellent food selections. Traditional food complemented Korean drinks (or perhaps it is the other way around). Atmosphere: 4/5 – A bit dark, yet nicely lit to create the proper drinking mood. However, being a bar, the place can be noisy and smokey at times. Service: 3/5 – Nothing much stands out. Our server was new, and more than a little confused. We'll revise this rating after our next visit.